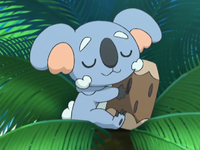 Komala is a recurring Pokémon that is often seen near the Pokémon School on Melemele Island. It will ring the school bell at the appropriate times. Alola, Alola!アローラでアローラ！ タケシとカスミ！An Alola! in Alola! Takeshi and Kasumi!